Tokyo Rebel: New BTSSB and A/P items! twilight Circus and more! New BTSSB and A/P items! twilight Circus and more! Yesterday we received a quick new shipment from Baby, the Stars Shine Bright and Alice and the Pirates, including the rest of our twilight Circus stock! 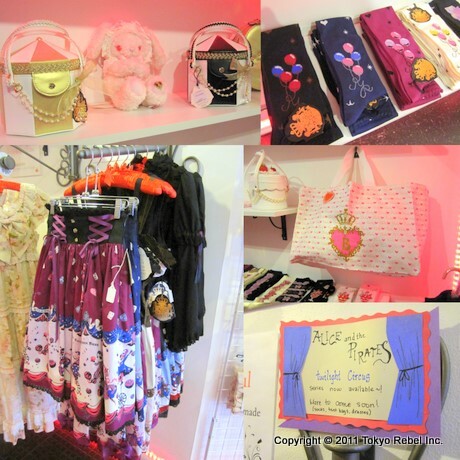 We now have both styles of jumper skirt, one-piece dresses, skirts, socks and the cute circus tent bags! We also received Usakumya pochettes in pink (white sold out by reserve), and the cute, inexpensive and very large Princess Drop tote bags. We are still waiting for large Usakumya rucksacks as well as Usakumya mini minis - those will arrive in the next shipment. Stop in our store to check out these items! We'll also be posting them for purchase via our web site later today or tomorrow. You can see (and order) the items we've already received previously in the twilight Circus series on our site here.